To kick things off, we had a NFC North matchup between the division-leading Bears and the polar opposite Lions. But there was one glaring hole in Chicago’s lineup this week: the absence of quarterback Mitch Trubisky. I’ll be honest, I thought this was going to be a lock for the Lions. Chase Daniel had other ideas. The Bears backup put together an impressive performance as Trubisky’s replacement, throwing for 230 yards and two touchdowns. The Bears didn’t have much of a ground game on Thursday, but they didn’t really need it. For the Lions, the lone bright spot was LeGarrette Blount and his two rushing touchdowns. Matt Stafford played like he was the backup quarterback filling in for an injured starter, throwing for just 236 yards and two interceptions, including a pick-6 in the fourth quarter that turned out to be the difference in the game. The second game of the day featured another team with quarterback problems, except this time the replacement wouldn’t be so lucky. With Alex Smith out of the lineup, Washington turned to Colt McCoy to lead the team and while he didn’t have an awful game, he wasn’t great either. He threw for 268 yards and two touchdowns, but also three interceptions, and wasn’t able to get much help from his running backs, as Adrian Peterson led the team with just 35 yards, while McCoy was second on the team with 28. Instead, the story of the game was the coming out party for Amari Cooper, making that first round pick that the Cowboys traded for him seem like a bargain. He finished the game with 180 yards and two touchdowns, scoring on a 40-yard play and a 90-yard play on back-to-back drives. 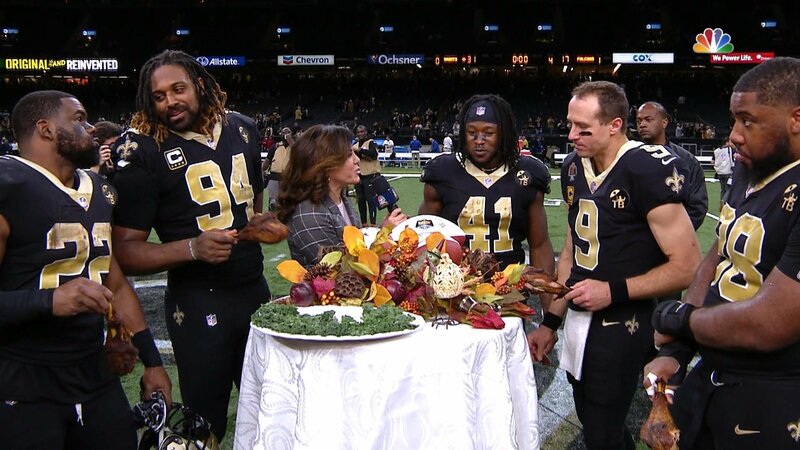 In case you couldn’t tell from the picture up at the top, the Saints had plenty to be thankful for after their Thursday night win against the Falcons. The Saints have been the best team in football all year long, and if not for a Week 1 loss to the Bucs, they’d be sitting at 11-0 right now. Drew Brees didn’t need to do much to put up those 31 points on Thursday, as he only had 171 yards on 15 completions, but still threw for 4 touchdowns, and just his second interception of the season. For the Falcons, Matt Ryan threw for 377 yards and two touchdowns as well as an interception, and was also the leading rusher for Atlanta with… 16 yards. 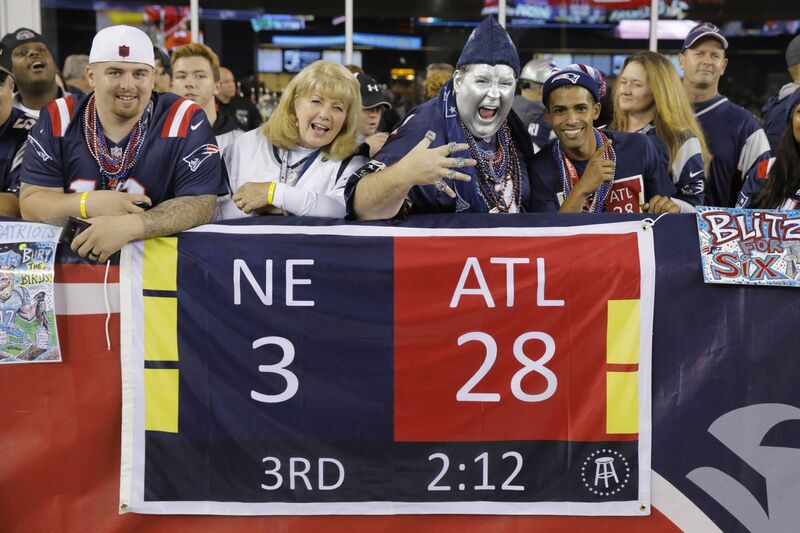 Things sure have gone downhill for the Falcons over the last couple years. It’s almost as if blowing a 25-point lead in a Super Bowl completely destroyed their confidence or something. The action carried into Sunday, and Baker Mayfield and the Browns found the spotlight for a few reasons. First of all, the Browns took the field with a little extra motivation against the Bengals. If being a division rival wasn’t enough, the Browns former head coach, Hue Jackson, joined the Bengals after being fired. The Browns took the lead early and were up 28-0 before the Bengals scored their first points with just 32 seconds left before halftime. Mayfield threw his fourth touchdown pass of the day on Cleveland’s first drive of the second half, and that was all the Browns needed to earn a 35-20 win. It’s safe to say the Browns were happy to beat their former coach, and that they didn’t exactly appreciate or respect him going to a division rival. Of course, the media picked up on this quick and asked Mayfield about it after the game, where he doubled down on his decision to snub Jackson’s attempted hug. The two teams meet again in just a few weeks from now, on December 23rd, and the Browns will be looking for an early Christmas present, a second win against Jackson. One thing we know for sure is that the Bengals will have to finish off the season without Andy Dalton, as the quarterback has been put on IR with a thumb injury. After starting the season 4-1, Cincinnati has now fallen to 5-6 and it likely won’t get any better with Jeff Driskel taking over the starting job. Really, there’s a pretty good chance that the Browns finish above the Bengals in the AFC North this year. If that happens, it might finally be time to shake things up in Cincy. In case you missed it, check out the Week 11 recap here.